If you own a GeForce GTX 1070, you might want to pay attention to this news-item as you could be effected. 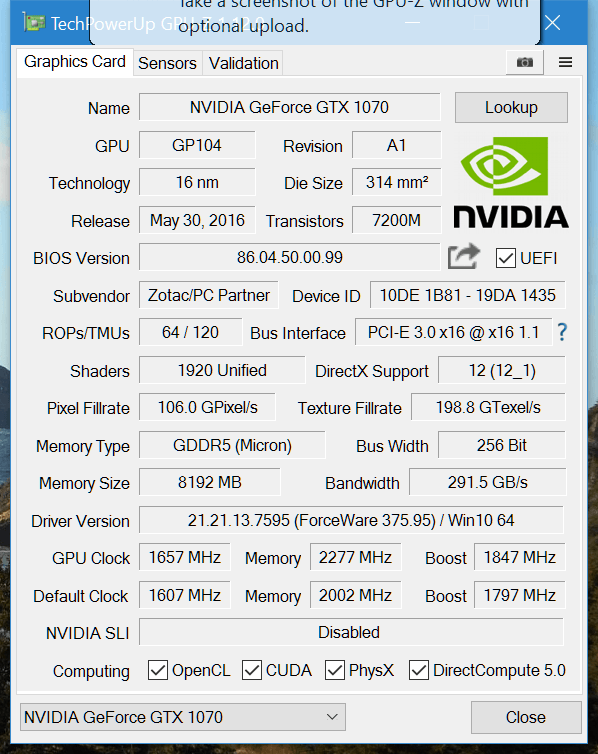 There have been some problems reported with certain GeForce GTX 1070 cards. After further investigation it became apparant that the issues like flickering and poor memory overclocking results on the memory sub-system are graphics memory related. GeForce GTX 1070 cards fitted with Samsung memory do not have any issues, however some manufacturers have or switched towards Micron chips, and these are the culprit of the reported issues. Especially during overclocking of the graphics memory problems will appear fast with bad results like checkerboard patterns. The problem is was found in the the speed of the voltage adjustment from the low power idle P-States to support the memory voltage requirements under load. If you can keep the idle voltage above 0.800V before you apply the overclock you never see the issue. Some users also have reported that at default configuration they noticed the occasional odd issue like flickering or experiencing graphical artifacts. Multiple brands are and could be effected. Right now most of them are working on (or already issuing) a BIOS firmware update for the graphics cards, these BIOS updates likely increase the voltage level of the GDDR5 memory. Mind you that this only effects GeForce GTX 1070 graphics cards fitted with Micron based GDDR5 memory. 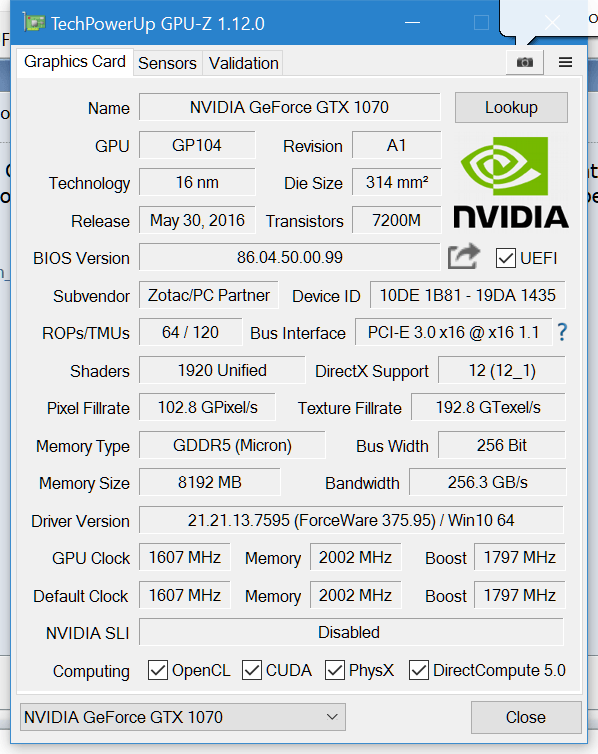 The most easy way to check what brand of memory your GeForce GTX 1070 is using is to download GPU-Z and read out the memory type (click thumbnail below for an example). The reality is that Micron’s GDDR5 memory chips shouldn’t really be any weaker opposed to what the Samsung ICs are doing. All cards we tested here ate Guru3D.com got Samsung memory. It however is not uncommon for manufacturers to switch to another brand of memory, as they purchase them in SMT batches and yes, a selection in price is made but should not effect performance. Due to the fact that our samples have Samsung memory we have not been able to verify any instability. Have you noticed any issues with your GTX 1070? If so, let us know in the comments of this news-itsem. 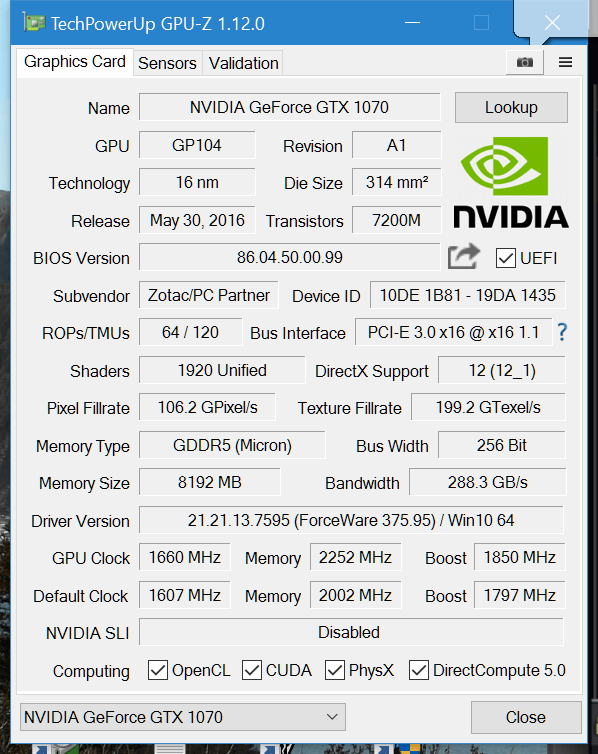 I just dug up the bios for each Zotac GTX 1070 someone had posted on overclock.net. I can confirm that the amp edition bios works perfectly. Getting +500 memory now stable. Before i couldn't get over 100 stable. All I had to do was run the proper exe. file for the OS I was using. In my case 64bit. I assume that the 2250 mem is 4x to get the memory clock, so 9000mhz now? EDIT: I am up to 550+ on the memory now using afterburner. I think that equates to 9200mhz so the update worked excellent for me. I won't bother to go higher yet. I tested using 3dm06/11/3dmark/Heaven/Gears 4 bench/GRID Auto sport so far. Everything seems to be perfect.